Martian Successor Nadesico is an epic space opera, running 26 parts and the better part of ten hours. It’s also a farcical comedy, targeted knowingly at fans of epic space opera. Its trick – which defies physics in ways to give any Scot spaceship engineer conniptions – is to continually have its cake and eat it. It wears its decades-long anime heritage proudly, yet it’s very much of its moment, the mid-1990s. Nadesico came out just before two American fantasy hits would do much the same as it had done first: Galaxy Quest in cinemas and Buffy the Vampire Slayer on television. More on them later. If you had to sum up the plot of Nadesico, “spaceship of fools” would cover a lot of it. It starts like genre SF. It’s 2196, and Earth is at war with aliens called Jovian Lizards, with colourful space battles, human mecha, weird flower-shaped organisms, the works. In the opening episode, a crew is assembled, consisting of several oddballs and a real basket case. That would be Akito, an orphan boy who shouldn’t be on the ship at all, but who blunders aboard after bumping into its captain, the lovely Yurika. That’s quite a shock for him – Yurika was his childhood friend on Mars. Ah yes, Mars is a big part of the backstory. Akito and Yurika both grew up there on a human colony, but Yurika was sent back to Earth, bidding Akito a teary goodbye. Just afterwards, Akito’s parents were murdered and the Jovians wiped out the human colonists. How the child Akito survived – and how on Earth he got to, well, Earth – is a mystery, but it’s left Akito with a head full of trauma. When he learns that Yurika’s spaceship is headed up to Mars, he’s overjoyed. At last, the chance for answers! From that synopsis, it may sound like Nadesico can’t be much of a comedy. In fact, the “straight” story is nestled among extremely broad gags, the sillier the better. For example, in the second episode, Akito tells Yurika (and us) about his parents’ killing, and says darkly that if Yurika had anything to do with it, Akito might kill her. How a little girl who’d just left Mars could have anything to do with a double murder is anyone’s guess, but Akito’s that kind of guy. Yurika’s reaction… is to ditzily assume Akito is talking about ladykilling, and to swoon in romantic delight. Yes, it was that kind of childhood friendship for her, and yes, she’s really that dense. So begins the voyages of the Nadesico, as the series spaceship is called. It’s hard not to notice that a lot of its crew are cute young women, many of whom take some degree of interest in Akito. So yes, there’s a certain amount of harem humour (a genre that had been popularised by another 1990s space adventure, Tenchi Muyo). Nadesico also follows in the tradition of “girls in space” anime, established in the 1980s by the likes of Zeta Gundam, Gall Force and most famously, Gainax’s Gunbuster. Gunbuster seems to have been a particularly heavy influence on Nadesico. Both series begin in ludicrously goofy fashion, and indeed stay goofy for a long way, but with constant hints that there’s a real story growing underneath. In Nadesico, the first shock is at the end of part three, when a character we assumed was going to be around for the whole show is suddenly killed. Given Nadesico has many nods to Star Trek, this might have been inspired by the opening season of The Next Generation, which played a similar trick. Other bonuses for the SF-literate include the strange name of the secret Nadesico project, Schiaparelli. 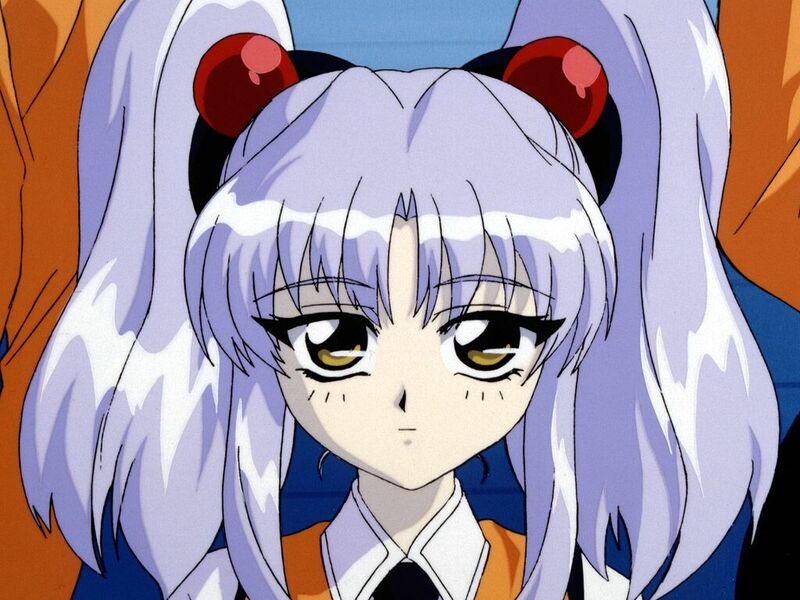 When Nadesico came out before Wikipedia, it would have been harder for fans to google the sly reference. Schiaparelli was an Italian astronomer, whose (mistranslated) observations gave rise to the myth of canals on Mars. But the big reference in Nadesico is to anime’s own history. There’s a huge subplot in the series about Akito getting hopelessly hooked on a vintage Japanese cartoon, called Gekiganger 3. We see the cartoon itself, drawn in lovingly retro style. For anyone wondering, it’s a fake but a loving fake, a parody of real anime cartoons from the 1970s. 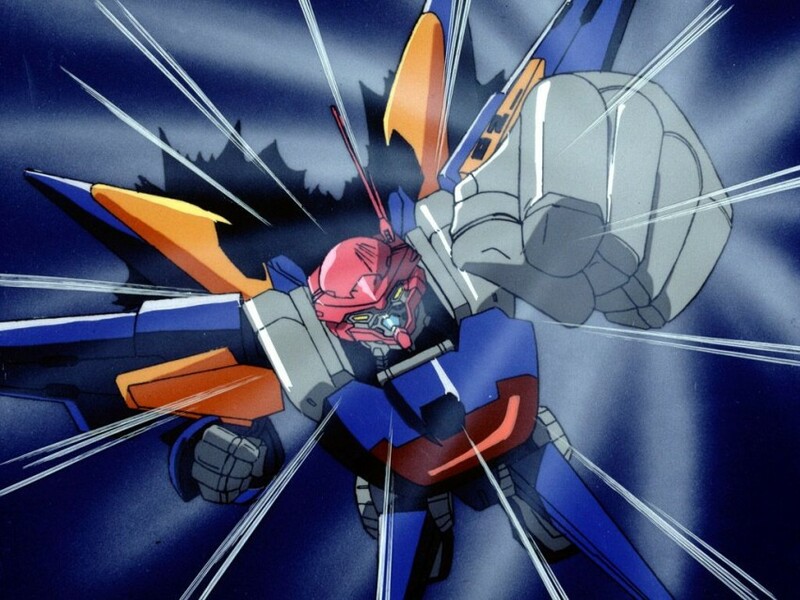 We’re talking about “Super Robot” anime, those ludicrous, passionate hero fantasies whose crude drawings and emotions burned the hearts of their child audiences. The most famous representative is 1972’s Mazinger Z, created by Go Nagai. The Gekiganger 3 subplot quickly goes meta, and then very meta. 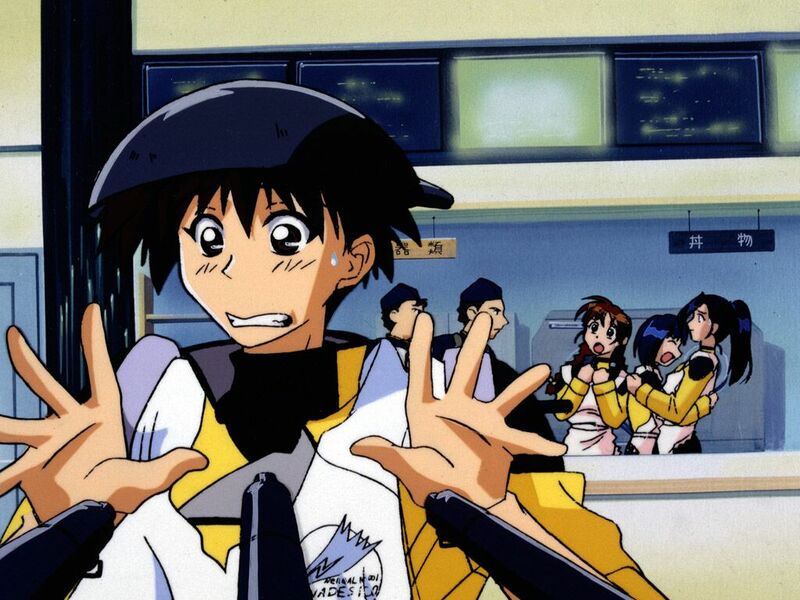 Events in the “show-in-a-show” cartoon anticipate Nadesico’s own plot. (Weirdly, Satsohi Kon would do something very similar less than a year after Nadesico, in his anime psycho-thriller film Perfect Blue.) By the middle of the series, there’s an episode where reality flips round Escher-style, and the Gekiganger characters are shown watching Nadesico. Up is down and short is long. And this meta-madness brings us back to the comment at the beginning of this article about Buffy and Galaxy Quest. Of course, there had been “knowing” anime SF parodies years before Nadesico. One of the biggest, Project A-ko, was made a full decade earlier. 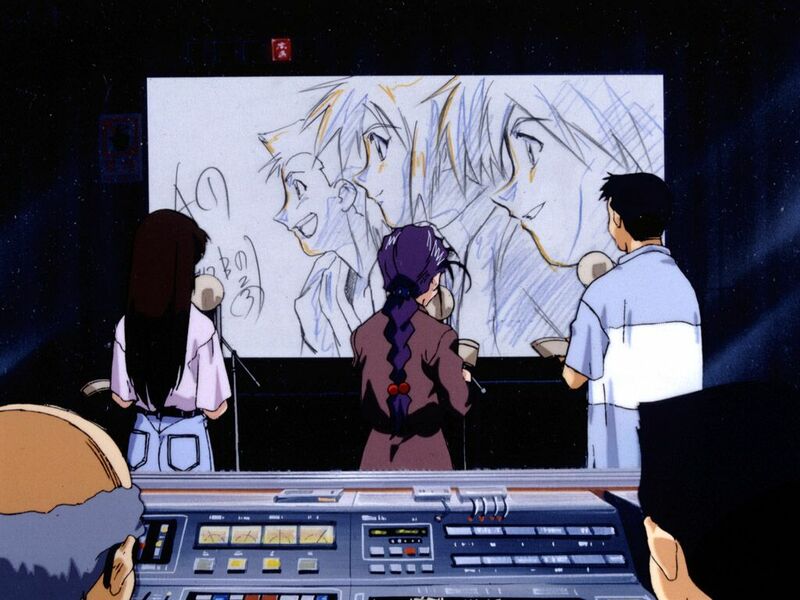 And in the intervening years, the Gainax studio had made its name making “meta” reflections on fandom, from Eva to Wings of Honneamise. But Nadesico feels like a new kind of synthesis. Nadesico is a parody in love with its source, which goes for meta-aware belly laughs and big hairy adventure thrills. It treats its anime precedents with the same comic affection as Galaxy Quest would lavish on the 1960s Star Trek. It engineers a story-arc with the same concentration that Joss Whedon would soon do on Buffy. And in doing so, Nadesico succeeds where much “straight” SF fails… for Nadesico correctly predicted the future. Martian Successor Nadesico is released in the UK by Anime Limited.